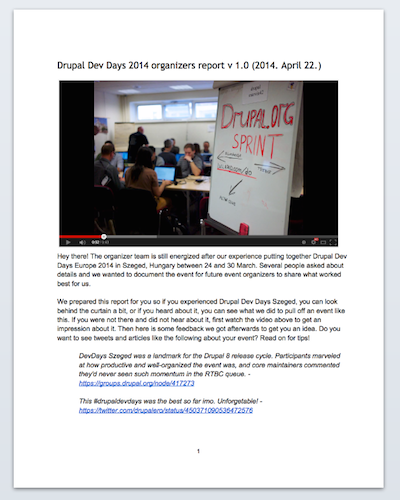 The organizer team is still energized after our experience putting together Drupal Dev Days Europe 2014 in Szeged, Hungary between 24 and 30 March. Several people asked about details and we wanted to document the event for future event organizers to share what worked best for us. We prepared a report for you so if you experienced Drupal Dev Days Szeged, you can look behind the curtain a bit, or if you heard about it, you can see what we did to pull off an event like this. If you were not there and did not hear about it, we included several feedback references as well to give you an idea. Do you want to see tweets and articles like those about your event? Read the report for our tips! We definitely did not do everything right but we hope we can help people learn from the things we did right. Excuse us if the report is a bit too long, we attempted to pack useful information to every single sentence to make reading it worth your time. Send questions and comments to the team. 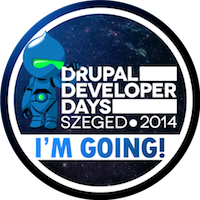 Five good reasons to register for Drupal Dev Days Szeged now! It is the biggest distraction-free sprint to work out remaining issues in Drupal 8 in the whole year. The sprint runs from Monday morning to Sunday night. Szeged wants to provide enough but also be out of your way to be awesome! For example, we booked the same venue up until midnight each day. We believe it is essential for a successful core sprint to have core committers on location. Szeged will have Alex Pott and Nathaniel Catchpole with Angie Byron supporting from home while we sleep. If you are a core developer in any capacity, having these two great leads directly at the same place is an amazing opportunity. Of course there is no requirement to be a core developer to attend! If you want to join the list of almost 1800 Drupal 8 developers though, Drupalize.me is flying in Joe Shindelar and Amber Himes to deliver the Community Tools Workshop to get you on board with all the tools and processes used in Drupal core and contributed module/theme development. Great new skill to have under your sleeves in 2014. There is not much hard about it once you get started. Szeged is a great cozy town! Many of those who have been there in 2008 asked us repeatedly to organise a come-back opportunity. Here it is and it only costs 30 EUR now! See our interview video on Szeged experiences at http://szeged2014.drupaldays.org/community/attendees. You won't regret coming. Read more about Five good reasons to register for Drupal Dev Days Szeged now!